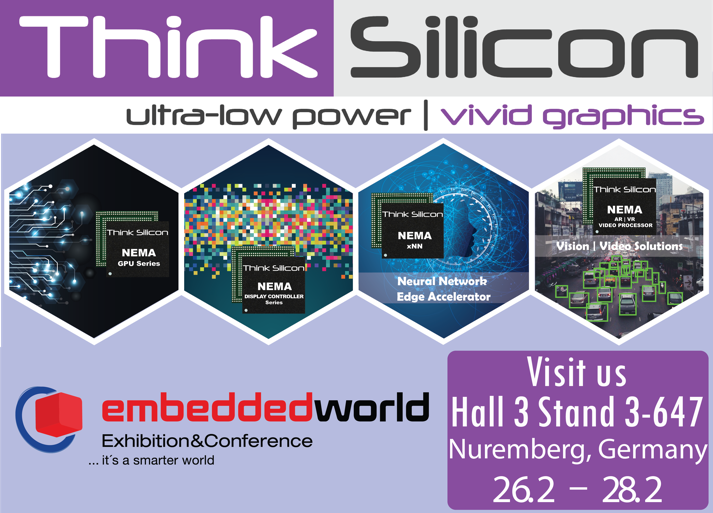 Visit Think Silicon’s booth 3-647, hall 3 at Embedded World 2019 from February 26th till February 28th in Nuremberg, Germany. Embedded World attracts more than 30,000 attendees and more than 1,000 exhibitors, offering the embedded community the opportunity to see the latest innovations in embedded technologies. While you’re at the event, be sure to stop by the Think Silicon booth so as to explore our proven methods and solutions aimed at ultra-low power connected wearables and low-power embedded applications. Also, you will have the chance to get informed about the current TETRAMAX open calls supporting digitization in Europe in customized low energy computing. Would you like a meeting? Just drop a line at info(at)think-silicon.com. TETRAMAX is a Horizon 2020 innovation action within the European Smart Anything Everywhere (SAE) initiative in the domain of customized and low-energy computing for Cyber Physical Systems and the Internet of Things. As a Digital Innovation Hub, TETRAMAX aims to bring added value to European industry, helping to gain competitive advantage through faster digitization. The project partially builds on experiences with the TETRACOM project during 2013-2016. TETRAMAX was launched in Sep 2017 and runs until Aug 2021. © 2017-2019 TETRAMAX, Technology Transfer via Multinational Application Experiments. All rights reserved. The TETRAMAX project has received funding from the European Union’s Horizon 2020 research and innovation programme under grant agreement number 761349.